The procedure results in the whitening of teeth by a shade or half a shade, a significant improvement of the health of mucous tunic of the mouth, reduction of bleeding in the gums (in some cases, a complete cessation), and the absence of halitosis. In addition, the doctor recommends the products for individual care for teeth and oral cavity at home (pastes, gels). If so required, the doctor may appoint an extra checkup and hygiene control which will be carried out 10 to 14 days after the treatment. The price of ultrasonic tooth cleaning depends on the severity of dental plaque (its amount). 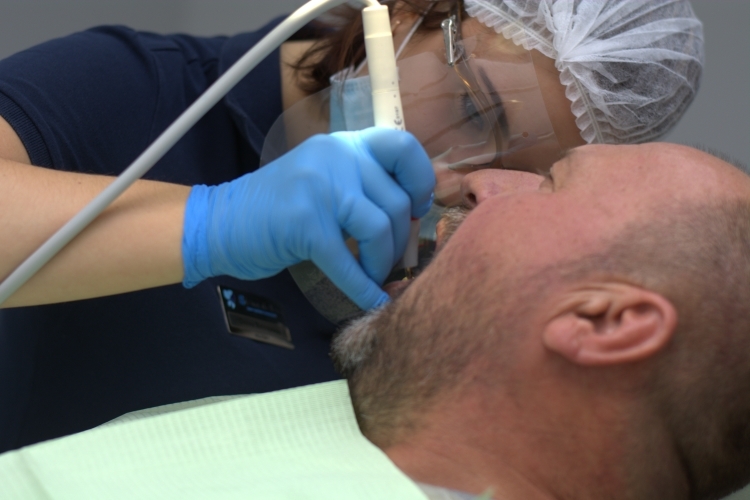 In the course of a free consultation, and after examination of teeth and oral cavity, our specialist will determine the appropriate method for dental plaque removal which will be appropriate in your individual case, as well as its cost. The doctors from our Center will select an optimal technique for professional tooth cleaning that will not cause any damage to the tissues of the teeth. They will also offer you different options regarding the comprehensive methods for dental care that should be conducted after the treatment.